Goofy, silly, friendly. This is how Chicago barber Pete Huels, 40, describes his shop. Pete’s Barber Shop, located in Avondale, offers traditional, low-maintainance men’s haircuts and shaves but with a hipster twist. It has been a staple neighborhood hangout for men since 2011, when Huels opened the place. The two-chair barbershop full of vintage, funky decorations doesn’t take reservations. Men come in, sign their names on a white board, sit and chew the fat while waiting — sometimes up to an hour — amid the sounds of razors buzzing and scissors clipping. Some help themselves to the beer that owner Huels keeps in the fridge. Free of charge. 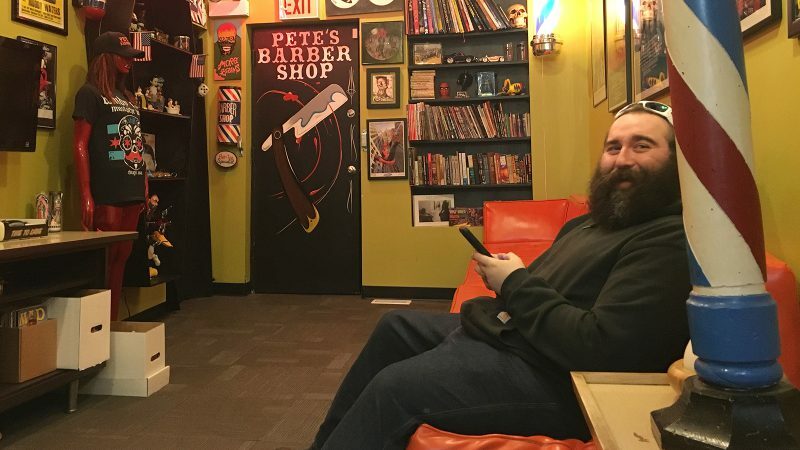 Haircuts are the biggest part of the business (Pete’s charges $25 for a haircut), but the shop is also known for its beard trimming and shaving. A shave costs $30 and a beard trim is $10. A former union painter and punk rock musician, Huels has been practicing traditional barbering for 13 years, including some 3,000 hours of training. He opened his place after trimming hair for four years at Joe’s Barbershop in Logan Square — one of the city’s best-known barbershops since it opened in 1985. Inspired by Joe’s, Huels opened his shop with two vintage chairs that his wife, also a hairstylist, found for him on Craigslist in Iowa. A small number of customers, whom he calls his “original 40,” followed him from Joe’s. In their heyday in the late 1800s and early 1900s, neighborhood barbershops rivaled saloons in popularity. Men frequented the barbershops not just for haircuts or shaves, but to socialize. The craft of traditional barbering has been on the wane. The number of licensed barbers in Illinois stands at 5,235 in 2017, down 8 percent from 2013, according to the Illinois Department of Financial and Professional Regulation. But old-fashioned barbering has its own loyal customers, ranging from nostalgic old-timers to young hipsters — many of them sporting full beards. Pete’s serves a diverse crowd, Huels said, many of whom are young Latinos and Asians. Competition comes from full-service salons, where more men go for sophisticated, high-maintenance hairstyles and services. This doesn’t bother Huels. Dave Hursey, 49, an account manager at Southern Glazer’s Wine and Spirits who has frequented the shop since it opened, said he prefers the quick haircuts here, and he likes the idea of supporting small, local businesses. The popularity of the store has grown over the years by word of mouth as well as with the help of online review platforms. It is among the highest-rated barbershops in Chicago on Yelp, a popular online review platform, with an overall five-star rating. 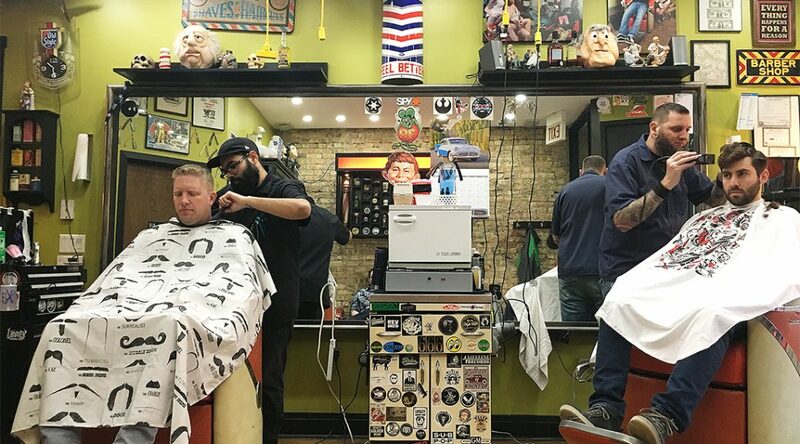 The prices at Pete’s are pretty standard among Chicago’s traditional barbershops, but they have risen as rents have gone up. Today’s price for a haircut is two-thirds more than the $15 charged six years ago. It will soon rise to $30, Huels said, due to another rent increase. That’s still below the average for a man’s haircut in Chicago of $32.33, according to a 2015 study of prices and wages by UBS. Huels and his second barber, Johnny Lopez, work almost 10 hours straight on weekdays, spending an average of one hour on each haircut, which make up most of the shop’s revenue. Huels said he takes in about $2,000 a week in revenue, or about $104,000 in annually. And he is not trying to work around the clock to pocket more money. Huels and Lopez have worked longer hours than usual since a third barber left in November. They are looking for a new barber to balance the workload. Lopez, 28, who joined the barbershop last year, said he is satisfied with what he earns at Pete’s, getting a more-than-50-percent commission from each haircut. It’s more, he says, than he would make at a corporate venue. Huels prides himself on providing good customer service, which he sees as the key to a successful business. He offers advice to help solve clients’ hair or skin “predicaments” — often by making fun of them. The most common issue? Dandruff, Huels said, smirking. And surprisingly, men’s haircuts aren’t any simpler than women’s, he said. Customers like to talk about hairstyles and hair problems here, and for regulars, more personal subjects, such as their love lives. The barbers’ personalities and the shop’s vibe are the big draw, said O’Brien the bar owner, as he sat on the couch in the shop’s waiting room full of comic books and vintage posters. Lopez shares the same passion as Huels and cherishes his own childhood memories of barbershops. Huels has no plan to expand, preferring to keep the barbershop small, with a neighborhood vibe and his own brand of humor.